From The Unknown | Thoughts and Opinions from someone who is unknown and once published! Thoughts and Opinions from someone who is unknown and once published! Seven years ago, on May 8th, 2010, I graduated from seminary. It was an exciting time. I was done with my academic work for the time being and had finished a goal that I had set out to accomplish back in August 2002. I had earned a Master of Arts in Theology and now a Master of Divinity. To those who may not know, a Master of Divinity degree is a 96 hour masters program. I would liken it to the MBA (Masters of Business Administration) in the secular world. Seven years ago, there was a great deal of excitement because now I could focus on full-time vocational ministry. I had wanted to go on and pursue additional education. I had applied to attempt to work on a PhD but was not accepted. I had thought about working on a DMin (Doctor of Ministry degree) most seminaries require that you have at least 2-3 years of post MDiv experience so that was out. Back when I graduated from college in 1992 ( yes I am that old) I was basically told that because I was single and had no experience (outside of being a church layperson) that I had no right to expect anyone to hire me. Fast forward to 2010, I was excited because maybe things would be different than when I had finished college 18 years earlier. I was sadly mistaken, if anything, things had taken a different turn, now instead of using the unmarried and inexperienced argument, now I was facing the grim reality of being over 40 with no experience and recently married with a 4 year old son (our daughter was born July of 2011). I had actually started looking for a place to serve vocationally in January of 2010 which was four months prior to graduation. I decided to keep a log of places that I had applied or submitted resumes to so that I would avoid duplications and be able to track the results. I applied for four different jobs within a ten day time period in February of 2010. I was excited but soon to learn very quickly that churches and ministries do not always respond to resume submissions even though they request a resume. The first two places that I sent a resume to never even bothered to respond and I found out later that they had called someone else. I was unfortunately excited about opportunities and naive in thinking that somehow things were going to be different. By the time graduation rolled around, I had applied or submitted my resume to six different places and had received three no responses and three declines right out of the gate. This was going to be a challenge. I graduated on a Saturday and unfortunately was back at work on Monday like nothing had happened. I kept praying and thinking this is going to be different than college was. I was in for a rude awakening. By the end of my first year after graduation, I had submitted my resume to 24 different ministries and churches. The rejections increased and I was wondering what was going on. Did I do something wrong? Is there something wrong with me? By the end of the 2nd year after graduation I had sent my resume to nine different churches/ministries and still the rejections increased. One church looked at my resume and after filling out two questionnaires rejected me and I emailed them back trying to figure out what I was doing wrong. They said that because my background was primarily in administration, that I would be a micro manager and they didn’t want that. That was hard to take especially since I myself resent being micro-managed. I never had an interview with them, they deduced it from my resume (albeit a false deduction by them) As I came to the end of the 2012-2013 year, the discouragement set in very hard and I stopped looking. I did not look or send a resume since 2/2/2013. I determined that from this point forward that I was not going to send another unsolicited resume because I had experienced so much rejection and discouragement. I was able to keep my mind off of it because I was working full time and was doing some traveling for my job. Also, I was able to do a fair amount of pulpit supply preaching and speaking during this time. That was going to change in 2014 when I was laid off from my job. I thought maybe this would be the opportunity to get into full-time ministry. I was sadly mistaken. I was facing the decision of either going out on severance and having that last maybe 6 months and hope to find a job while other large employers in the Minneapolis area were laying people off in droves or move to TX and move into a similar position. With a wife and two kids, we moved to TX in August of 2014. When we moved, my preaching stopped because I did not know anyone and no one knew me. I went from being fairly active preaching and teaching to nothing. Not only was there stress in moving, I was trying to deal with the issue of trying to find a new church and “start all over again” We went to a church for 9 months but it wasn’t a good fit and we left quietly. Now I was dealing with trying to adjust to not preaching or teaching any longer. We did end up finding a good church in January of 2016. I received a letter from a church in MN April of 2015 and filled out two lengthy questionnaires only to be rejected. The last resume that I sent out was in September of 2016. The emails and phone calls have just about stopped and dried up. Although I did recently receive an email from a church that I had never heard of before, only to have them tell me that I was not selected to be their assistant pastor. I was used to this response, only in this case, I had never applied for the position. It is hard to answer the question when people ask you what do you want to do with your career when you are 48 years old and thought that you would be able to serve in full time ministry, after all that is what I went to college and seminary for and spent over $50,000.00 on an education? Now, I am being told that I am too old and I have no real church experience (never served as a church staff member). This morning, Monday, May 8th, 2017, seven years to the day that I finished seminary, I got up and went to work for the same company that I have been working for almost 15 years now (I started with them while I was in seminary) and came home and had dinner with my family like I do every evening. I haven’t preached a sermon since last summer and I teach in our Sunday School class about once every 4 months or so. I have to work hard to keep up my Greek and Hebrew skills because I do not use them very often anymore. I feel like the closer I get to 50 and the further away I am from when I graduated, the less relevant I am because I am not part of the millennial generation. Some of the guys I went to seminary with have already changed churches within the last seven years, some are still at the same place ministering, and unfortunately some have disqualified themselves from ministry. I have prayed that God would open up the right opportunity for me since finishing seminary over seven years ago. I have done nothing to disqualify myself from ministry even though I have been treated like I have been. I have been reading the book Deep Work by Cal Newport. I have made it through the theoretical portion of the book and am now in the practical section where you attempt to put the ideas into practice. I do not remember how I came across the book but I was patient and it was finally available at our local public library. I think the interest in the book has been fueled by a frustration of sorts that I have faced more recently when the company I work for moved into some new facilities. I am glad that we have new facilities but I am finding it hard to adjust to the new normal of the open concept floor plan where there are no cubicles or dividers. Offices are reserved for those who are director level and above. There are huddle rooms, focus rooms, etc. The focus rooms are a bit small and tend to be on the claustrophobic side. The huddle rooms are good especially if you have a day full of conference calls. Working on the floor is nothing more than a big distraction now that there are no walls. Through personal experience and reading enough articles on the subject, I knew firsthand that multitasking does not help one become more productive, it makes one stupid and less productive. Not only is multitasking bad, being distracted is equally as bad. We are distracted by notifications from our smartphones (guilty), notifications when we receive an email in our inbox both on our smartphone and while using our work computer (guilty). Instant Messaging at work is another major distraction because we are always reachable. Once we respond to those distractions, it is very hard to get back to what we were doing. How many times have you been in the midst of something and something beeps at you, whether it is email, instant messenger, etc. For the record, I silence my phone while I am work and have most notifications turned off. My phone is not my biggest distraction during my workday, it is the tools like email and Instant Messenger. I will admit it is very convenient to “ping” someone to ask them a quick question rather than clogging up their email in box with another email. I have been guilty of using Office Communicator at work to do this, not realizing I could have been contributing to someone else’s distraction. I know that I have been distracted many times in the midst of a task by an IM and I also know how hard it is to get back on task. For several weeks, I was already frustrated with the new “open” floor plan but I also noticed that I was unable to really make any significant progress on my daily work. Before writing this post, I went back and checked my work calendar and there were two days where I had very little time to get my real work done. I spent those days in meetings, on conference calls, dealing with email, etc. Ironically, on April 13th (my birthday) I was literally busy from the time I arrived at work shortly after 8 am until lunch time at 12:30 and then again from 1:00 until I left around 4:30 pm. I had two open slots that were unscheduled, but I was so distracted from various back to back meetings and conference calls that it was hard to focus for those “open” time slots. I decided to try to see if I could do Deep Work today and it was the perfect day to try it because for the first time in weeks, my work calendar did not have one meeting, one conference call on it. I went in last night and blocked my time in 90 minute increments for my larger tasks. When I got to work I was going to use a huddle room, but there was some issue with the wireless network, so I had to drag my stuff to a desk on the floor and resign myself to being distracted at some point because of the noise, chatter, etc. One of the first things I did was turn off the annoying sound and the display when you receive an email in Microsoft Outlook, you know that annoying box that comes up when an email arrives. That is doing nothing more than training people to be like Pavlov’s dog, when the chime goes off and the dialog box appears, you check the email. I tried something different, I turned off the notifications and gave myself a 30 min period in the morning to deal with emails and I didn’t close out Outlook, it stayed open but I didn’t check it every ten seconds. That was hard because I was so used to feeling like I had to respond to every email as soon as it hit my inbox. I think as long as I respond back in the same day or within 24 hours is acceptable. This experiment worked because I didn’t feel as stressed and I was able to get through all of my emails for the day. I did an assessment of my data and productivity and found that I had one of the most productive days that I have had in a long time. I plan on trying to do more deep work tomorrow. I also plan on writing a more detailed review of the book Deep Work once I finish the remaining pages that I have left. I am facing a slight quandry. Recently, my employer relocated to a new building and it has lengthened my commute from 45 mins to 1 1/2 hours. Right now, I leave the house at 6:45 am and I do not get home until almost 6:20 pm (that is if all trains and buses are on schedule – I take 3 trains and 1 bus). Someone said I should just borrow the money to buy another car. I thought about it and realized that wasn’t a smart idea. I would be trading my time for debt and I think that my time is more valuable than debt (especially debt on a depreciating item that loses value) Sometimes, I wish that I had another car but I am also thankful not to have the car payment to go along with the other car. It gets discouraging when your train or bus is late because then it has a domino effect. We recently completed Financial Peace University at our church and it has transformed our financial life. We are working our plan to get out of debt and I have to remind myself that I need to keep going and not get derailed. Getting out of debt is a process not something instantaneous. We have survived almost three years having one car. I think we can make it another year or so and get our debt paid and be able to save up money to pay cash for a car. Time is money and it is a valuable commodity, just not worth trading it for debt. 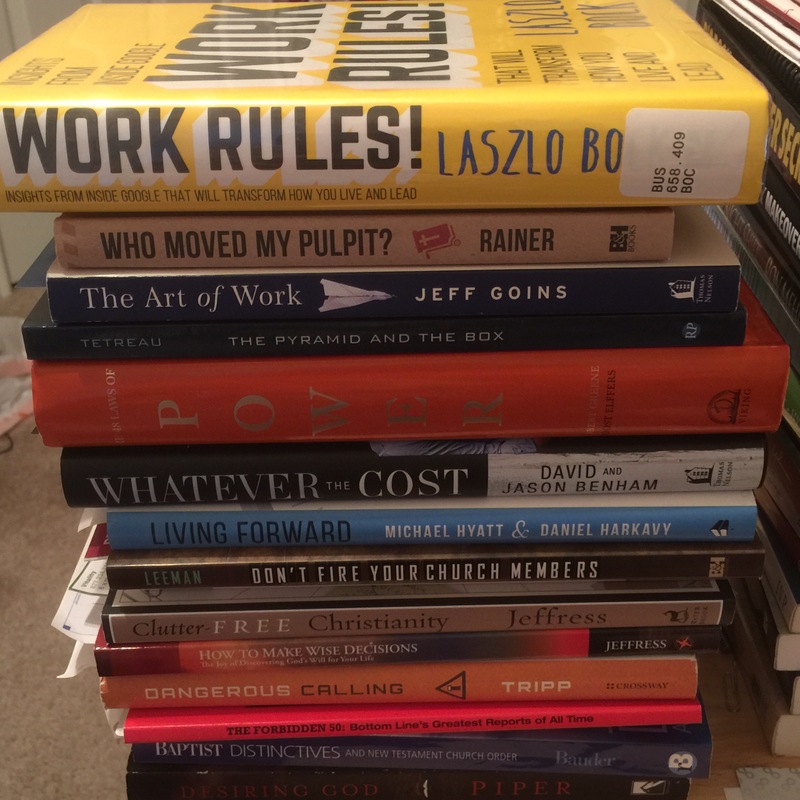 Work Rules – by Laszlo Bock – this book I have been wanting to read for some time. Mr. Bock is the leader of Google’s people function. If a company like Google can provide such wonderful perks for their employees and people are wanting to work there, then maybe there is something I can learn about employee satisfaction and retention? I just started this book earlier this week. What will motivate me to finish it is that it is due back to the library on June 29th – stay tuned for a book review. Who Moved My Pulpit? – by Thom S. Rainer – this book was released on June 1st, 2016 and I was chosen to be on the launch team. We were provided a number of free books to give away to others. I will mail out 12 books this week to friends in ministry. I also have a few to give away here on the blog, so leave a comment if you would like a book. If you are chosen, then I will mail you a book free of charge and hope that it will be a blessing to you. I am enjoying this book because it deals with the ever present issue of change within the local church and how church members and pastors respond to change. Here is a great quote from this book: “Sometimes the confused include those who want to hang on to some tradition for their own sense of security and comfort.” (pg. 22) This book is definitely worth reading, even if you are not a pastor because it will tip over some of your own sacred cows in the process. Stay tuned for a more detailed review. The Art of Work by Jeff Goins – this is a book that I read when I first purchased it, and I am now attempting to re-read and transcribe what I highlighted into Evernote for future reference. This is a great book to help one discern one’s calling in life. I am re-reading this to make sure that I didn’t miss anything the first time around. Another reason I am re-reading this is because I am struggling with what I am supposed to be doing with my life. I spent four years in Bible college, eight years in seminary and now six years post seminary and I am not doing what I have trained to do, serve in local church ministry as my vocation. The Pyramid and the Box by Joel Tetreau – this is a book that I have had in the stack for sometime but now it has been moved up. Joel is a pastor friend who pastors in Gilbert, AZ and is a fellow alumnus of Central Baptist Theological Seminary of Minneapolis, MN. I will probably read this book when I finish Who Moved My Pulpit since the subject matter is similar in both books. From what I have read of this book so far tells me that this work is something that new and experienced pastors should read and glean much from it. The 48 Laws of Power by Robert Greene/Joost Elffers – This is a book that I have owned for sometime and have started it and stopped it several times. The bright orange color stands out in the stack and after seeing a Facebook post on this book, I decided to read this book from start to finish and not quit this time. I realize that this is a secular book and I am looking forward to reading it and looking at it from my Christian worldview point. I can imagine that there will be things that I will disagree with from an ethical standpoint and other things that I can learn from it without an ethical conflict or conundrum. Whatever The Cost – by David and Jason Benham – this is a book that I picked up when the Benham Brothers spoke at the First Baptist Dallas Men’s Conference in April 2016. I had heard of the Benham Brothers through their ups and downs with the media over their reality TV show which never aired because they took a bold stand for Christ. This book tells the story behind the story of what happened to them with regard to their reality TV show and how it opened their eyes to what is going on in the media and the tremendous pressure that is placed on the media by activist groups and sponsors. Living Forward – by Michael Hyatt and Daniel Harkavy – this is a book that I preordered before it came out and was able to score a good book at a reasonable price along with some really great bonuses. I served on Michael Hyatt’s launch team for his book Platform when it first came out. This is a book that is similar to Jeff Goins book – The Art of Work. I stopped reading at Chapter 7 – Dedicate One Day because I have not had one day that I can do what this chapter is wanting the reader to do. When I find a day, then I will resume reading. Don’t Fire Your Church Members – by Jonathan Leeman – I want to read as much as I can on church government and really understand why I consider myself a congregationalist. This book would run in tandem with Joel Tetreau’s book The Box and the Pyramid. There is a shift in some churches to abandon congregational government and move to an elder rule type government which inevitably makes the average church member feel that they have no input into any decisions in church life. This book reinforces that congregational government is Biblical and should not be abandoned for religious political correctness. Every Child Can Succeed by Cynthia Ulrich Tobias – I ordered this book from Amazon at the recommendation of my brother in law who is a former school administrator. We were having some difficulties with my son in school and this book was recommended to us. I have read most of it and I have discovered my learning style which in turn helped me to discern his learning style. I also was able to gently refer this title to the school administrator at my son’s school – hopefully he will read it. Clutter-Free Christianity by Robert Jeffress – I received this book as a gift after attending the Step One class and luncheon at First Baptist Dallas. I have always enjoyed reading Robert Jeffress even before I joined First Baptist Dallas. I remember one of the first books that I read of his entitled Guilt-Free Living. This book appeals to me because I am a planner and an organizer by nature. I hate clutter and chaos. My desk at work is neat and clean. Don’t look at my office at home. It is cluttered and these books are stacked on a tray. I really work at staying organized but it is currently a work in progress as I also attempt to go paperless using Evernote as well. I have read the first two chapters in this book. How To Make Wise Decisions by Robert Jeffress – Another book by my pastor. This book also appealed to me to re-examine my calling in life. You know this must be a controversial book when on page 10, Dr. Jeffress wrote that his own brother wrote him a 4 page letter begging him not to write this book. I appreciate that he didn’t listen to his brother and he wrote the book. When I finish reading it, if things haven’t become clearer to me about my calling in life, I will definitely attempt to see if the Pastor will give me some time so we can have a conversation. Dangerous Calling by Paul David Tripp – Shamefully this is another book that I have had for a long time. I started reading it, would get convicted about something I read, stop reading it for a time, then resume and get convicted again and stop reading it. I finally gave up and decided to start reading it from start to finish. This also falls in line with several other books that I am reading with regard to calling and vocation. I have set some goals for myself to read and in some cases re-read some books the remainder of this year. I am not sure how I will do. I hope that by sharing this list, it will be a help and a blessing to someone. I am not famous or a celebrity but here is my reading list. Enjoy and leave comments as you are able! 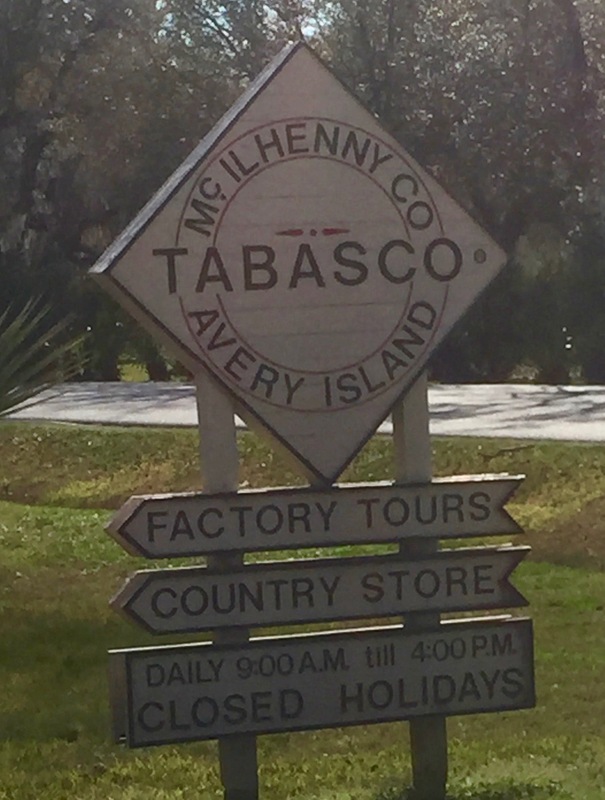 Recently, I finally was able to visit Avery Island, LA – the veritable home of Tabasco®. I had an opportunity over 20 years ago to visit Avery Island, LA and squandered it. I was determined to get here one day, but wasn’t sure if I would ever have the opportunity. We visit my in laws usually around Thanksgiving and Christmas while they are in Florida for the winter. I had thought about taking a day trip over and back but could not work out the details. Finally, we knew we were coming for Spring Break (which is unusually early this year – this week) and I delicately approached the subject with my family one night at the dinner table. Reactions were mixed and there was not much enthusiasm from either my wife or my four year old daughter (neither of which eat Tabasco®), my son wasn’t overly excited either, but he liked the idea of going somewhere new. We arrived at Avery Island at noon and figured that we would eat lunch at 1868 – a restaurant serving many items with Tabasco® in them. They did have some items for those who do not eat Tabasco®. I enjoyed the Avery Island Red Beans & Rice. My son enjoyed a Chili Dog – which he said was spicy. Each table had a wooden box caddy of at least 10 different sauces. After our lunch we decided that it was time for the tour. I heard that the tour had improved recently along with a new museum. If we had more time we would have also gone to Jungle Gardens and Bird City. The tour is self-guided and has nine different stops: You start at the Museum which is relatively new and has several exhibits surrounding the history of the island itself and the McIlhenny family. There are also several short videos that can be viewed at your leisure while in the museum. After the museum, the next two stops are the Greenhouse and the Barrel Aging warehouse. The Greenhouse shows how the peppers start from seeds and then into plants. 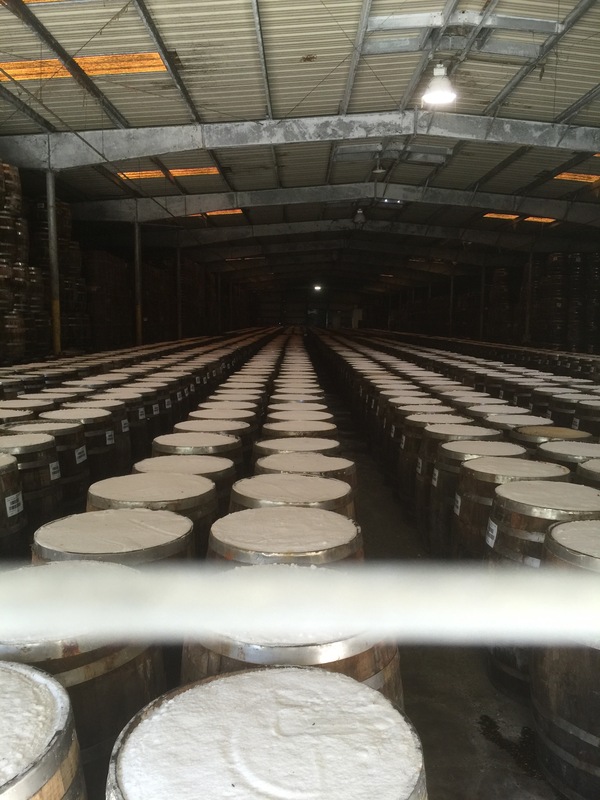 The Barrel Warehouse is where the mash is stored in white oak barrels where it is aged for three years. Each barrel is filled with the red pepper mash and then sealed and then it is covered with Avery Island salt to keep out the impurities while the fermentation process takes place over three years. Each barrel is labeled and dated. After leaving the barrel warehouse, we walked down the same path back towards the factory where a majority of the processes take place. Stop #4 was the blending operation where the mash is loaded into large vats after the fermentation process is completed and the mash is mixed with salt and vinegar and it is mixed for up to three weeks. Stop #5 is the Avery Island experience which gives more history and detail about the island itself. Step #6 is the Salt Mine experience. 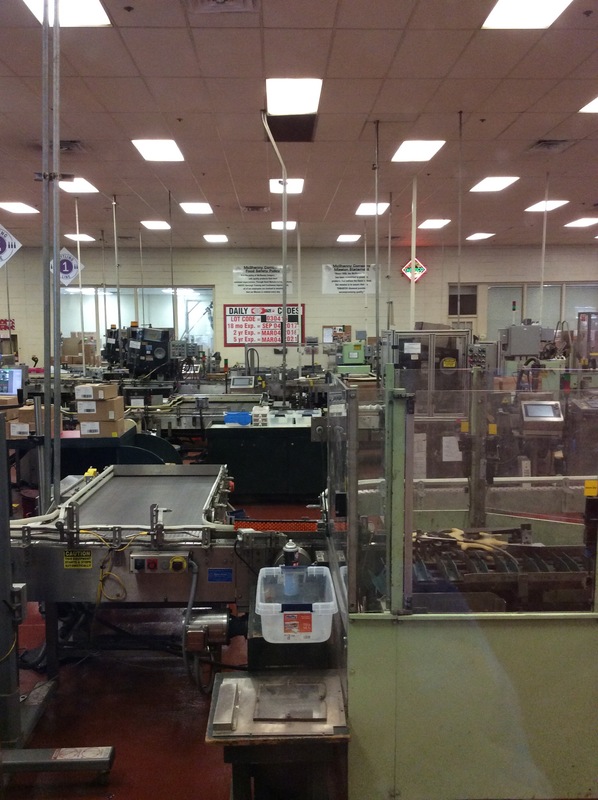 Step #7 is the Bottling line – they only bottle sauce Monday – Thursday. I enjoyed seeing the line operation, even though it was not operational when we were there. 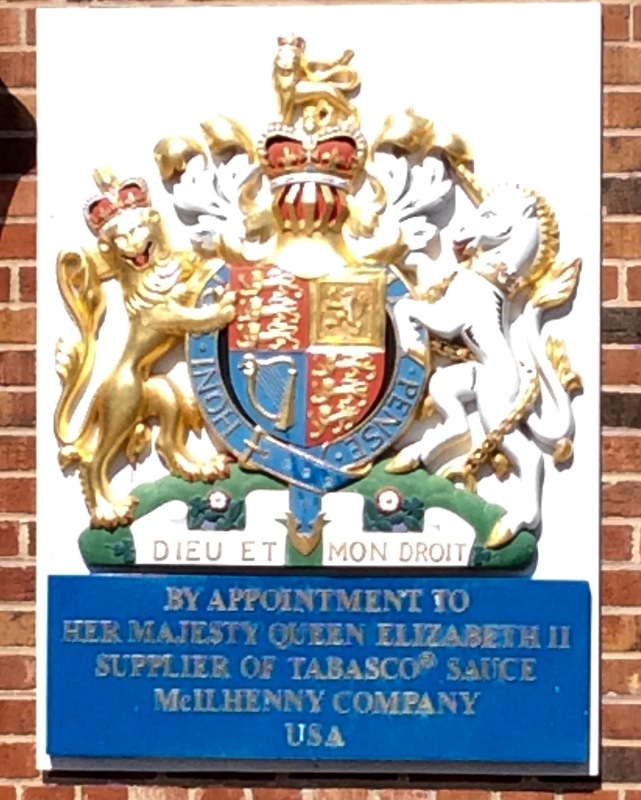 Did you know that Queen Elizabeth uses Tabasco? There is a royal warrant that was issued to the company back in 2009 and it hangs on the outside of the factory building. A royal warrant is a big deal. Not many US based companies can say that they supply goods to the Queen of England! The final stop that we made was to the Country Store. This is where you can purchase just about any item with either the Tabasco® logo on it or the actual products themselves. I bought several things, some sauces, a t shirt and a few other things. I had set a budget and surprisingly enough I went over by $15 only. Thankfully, I am able to purchase items online if needed since I wasn’t able to buy everything that I wanted. This was definitely a great experience for me since I am an avid user of Tabasco® as well as a great fan. I would love to come back and learn more about the history of the company and Avery Island itself. This would also be a company that I would love to work for if it were possible to do so without relocating to Avery Island (I think I would have a hard time convincing the family to make that kind of move). I would urge anyone who is a fan of Tabasco® to find a way in their lifetime to make a pilgrimage to Avery Island and take the tour, enjoy the 1868 restaurant and make some purchases in the Country Store. You will not be disappointed. I know that I greatly enjoyed my brief trip to Avery Island, LA. I hope that I am able to make another trip back sooner rather than later. Thanks also to my family who indulged me and tolerated this little detour even though they are not Tabasco® consumers like I am. Defending the world against bland food. I recently was made aware of a new book that piqued my interest and wanted to write a review of it. 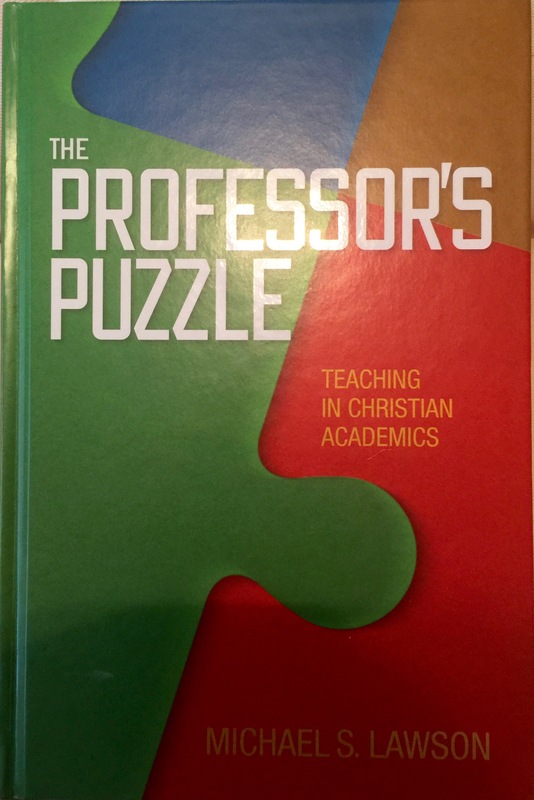 The Professor’s Puzzle is by Michael S. Lawson and it is a new book to the Christian education field. Even though I have expressed a call to pastoral ministry, educational ministry has also been an interest of mine since I have attended and graduated from Bible college and seminary. When I first picked up this book and started reading, I wondered if I was going to get lost in a sea of educational philosophy, terminology, or concepts that I did not understand. I appreciated the author’s labor in explaining each chapter in brief in the preface. Most book prefaces are quite brief and not very helpful. This preface is one of the best that I have ever read because it painstakingly explains each chapter without giving away the entire chapter content. This is helpful so as the reader, you know which direction the author is going. The author does start out the book with a chapter on A Philosophy of Christian Academic Education. He starts out by addressing the disparity between Greek philosophers and the Bible. Many times Christians are too quick to immediately dismiss the Greek philosophers, but I believe as the author does that we can learn something from them in relation to our faith. The author outlines this stellar answer on page 3. This is the first time I have seen an evangelical scholar really take the time to address the issue and relationship between Greek philosophers and Christian education. I knew after reading his answer that this was going to be a great book. Also in the first chapter he asks a legitimate question that all professors and institutions should be asking of every course offering – “How do students move from mere cognition about him to an intimate relationship with him? What role does/should a school have in this process? The relationship with students is under the absolute control of the teacher… The student’s perception of you, as a Christian teacher, is the platform from which you minister. Your behavior inside the classroom sets up the opportunity to minister outside the classroom. In furthering the relationship between teacher and student, the author talks about providing the students “a get to you know form” Also on pg. 228-229 he lists several different ways to show a personal interest in students. 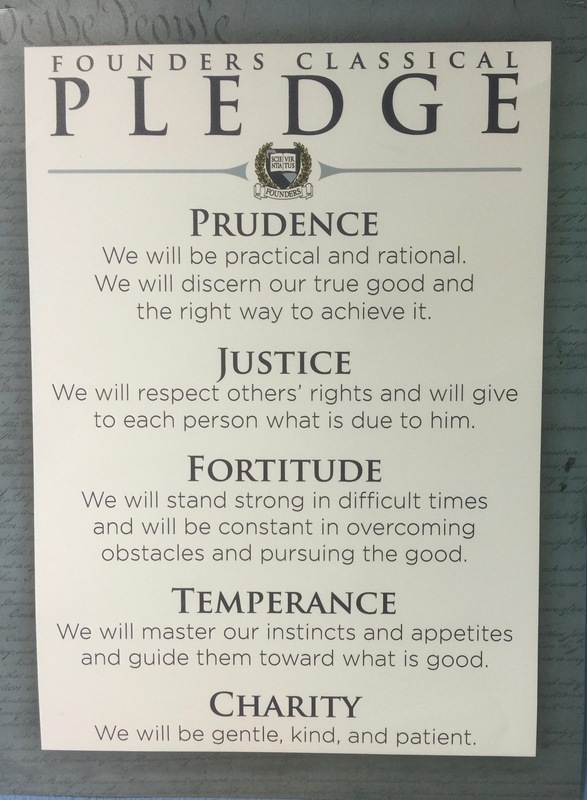 Many of us can probably think of professors that we have had at the college and seminary level who were good at this. Towards the end of the book the author talks about issues like funding, enrollment, faculty credentials, tenure. I love the quote about budgets that should be on the wall of every administrator in every institution of higher learning. In reality a budget is only a hopeful forecast of what might happen, assuming a stable income stream and no unexpected expenses. One factor that I am glad that the author discussed in the book, which is usually the “elephant in the room” in some cases. He talks quite frankly about the hiring practices in most higher educational institutions. I am glad that he addressed this quotation, but never really went beyond how to escape the phenomena that we call “politics”. I expect politics to be at play in the worldly institutions but find it shameful that they exist within Christian institutions. While good grades and grasp of content do matter, other factors often play a larger role in getting a teaching job. Auburn University published a study of junior faculty among theological schools. They reported that an applicant’s ‘being known in some way’ contributed greatly to their hiring. When schools looks to fill positions, senior faculty expressed concern about the new hire ‘fitting in’. Relationships and perceived attitudes greatly affected hiring practices. In their words, “connections count”. I found myself reflecting back a lot of my educational experiences in both college and seminary as I read this book. Overall, I highly recommend this book to current professors, students, and those especially who are considering a career in the academy especially those who will be teaching and training future servants of Christ. It would be a great honor to be able to meet the author personally and have a discussion about this book. Living in the DFW area might make that a possibility. Disclosure: I was provided a free copy of this book in exchange for my review. I was not required to publish a positive review. Recently, I had the opportunity to observe my son’s 4th grade class for a day. These are my observations and I was not prompted to write anything, but felt it might be a help to parents who might be considering a classical education for their children. We arrived at school around 7:30 am after my wife and daughter dropped us at the front door. For me, I had a bottle of water, a pen and notepad, and no cell phone (the school asked me not to use it while on campus, so I decided to leave it at home). After being checked in and getting my visitors badge, we went upstairs to my son’s classroom. There was a chair in the back right corner of the room waiting for me. I sat down and observed the students getting ready for their day, unpacking their backpacks and putting things away. There are no school bells like I was used to hearing in school, but rather precise time management. The school day started at 7:40 promptly. The students stood to their feet and their teacher led in the Pledge of Allegiance to the American flag. Then the students said the pledge to the Texas flag. No offense Texans, but this is the only state that I have ever lived in (California, Nevada, Florida, Minnesota) where they say a pledge to the state flag. A bit different, nothing inherently wrong with it, just just different. Then after the flag pledge were finished, the students also recite a school pledge. After the pledges were complete, the students had a moment of silence and then the day began with reading of Treasure Island aloud by various students with the teacher asking them about what was taking place in the story. Once they reached the end of the chapter, they put their books away and then had a spelling test. The students not only have to spell the words correctly, they have to divide the word into the correct syllable divisions. The words on the test that day were: consider, consideration, colony, colonies, colonial, colonize, sure, assure, raise, retire, divide, occupy, probably, probable, foreign, expense, respond, response, responsible, scissors. These were good spelling words and probably represented a fair challenge for the students. After the spelling test, we launched into grammar. The students were learning about phrases and clauses. The students were also reminded before they diagram a sentence to make sure that they analyze the sentence completely by identifying all of the parts of speech, phrases in the sentence. This was a gem, so I wrote it down, to remind my son later on when he struggles with grammar. Did you also know that an intransitive verb has no verbal object? I knew that but it has been a number of years since I have studied English intransitive verbs. About 8:45 the students were instructed to pack up their things and get ready for recess. The first recess was inside, downstairs in the cafeteria, the kids had time to use the restroom, eat a snack if they chose, and then run off some energy on the carpeted area. Most of them were involved in a tag-like game called frozen. I didn’t quite understand the game, but enjoyed observing as my son and others ran around and away from who ever was it. They were enjoying themselves and then as quickly as recess started it ended and it was back upstairs for more instruction. Math is different here at Founders because students are grouped by ability rather than their current grade level. For math, my son goes across the hall to the 5th grade class. The students change classes orderly and timely. Math starts promptly at 10:00 am. The teacher goes around and checks their homework ensuring that they have completed the required pages. They go over the previous night’s homework with each student having a turn to answer a question. The teacher has a unique teaching style by always roaming around the room and ensuring that the students are engaged and not talking or distracting others. The other thing that keeps them on their toes, is that they do not know when the teacher will call on them to answer a question, he was changing up the order so students needed to be ready. They were going over decimals and place value and converting decimals to fractions. One of the other gems that I took away was something the math teacher said and of course, I wrote it down. He said, “Before attempting to solve any math problem, first identify what it is that they are looking for” Another gem that I can use when my son is stuck on a math problem. After they finished going over the homework assignment, the teacher had the students come and pick up a small whiteboard and a dry erase marker. They then did some drills with decimals and rounding. The students really loved this and they were learning while having a little fun and using the whiteboards. Once that was completed, they went over what the homework would be for Monday and he also reminded them that they would have a quiz over decimals and converting decimals to fractions and vice versa. The period ended promptly at 10:50. The students went back to their respective classrooms and it was time to head to specials. Today would be Music and Art. Music was from 10:55 to 11:30. Today the students had two tests, one test was a written test and then they had a sight singing test over Do, Re, Mi, etc. I am not much of musician and do not read music, but I enjoyed hearing the students take their oral test and then when that was completed, they all sang together as a class up and down the Do, Re,Mi scale and did the accompanying hand signals. Class ended at 11:30 and they lined up to go next door to Art. Art was from 11:30 to 12:05. Today the students were making Chinese lanterns to coincide with their conclusion of studying Chinese History. The teacher gave them instructions and then they were off constructing their Chinese lanterns. When they were done, they hung their lanterns up and then it was back upstairs to the classroom for some more instruction prior to lunch. From 12:10-12:25 – the students were working a worksheet while others were reciting their weekly poem. At 12:25 they got ready for lunch. I enjoyed lunch with my son (we don’t get to eat lunch together during the week because he is at school and I am at work) I enjoyed sitting with him and few of his friends. When I finished lunch, I went up to see the Assistant Headmaster and we chatted for a few minutes about various things including my observations of what I had seen thus far during the day. We concluded our chat and the students were on their way back from recess. From 1:30 to 1:45 – more poetry recitations and working on the worksheet that was given to them earlier. I can’t remember the poem except that it was written by William Makepeace Thackeray. Shame on me, I heard it over 25 times that day. At 2:30 until 3:20 was their Science period. They were learning about the nervous system. Did you know that a human brain weighs about 3 lbs? I might have learned that at some point in my educational career, but it was good to be reminded again. They also learned about voluntary and involuntary actions. The school day ends around 3:25-3:30. The students packed up their things and then went downstairs to the cafeteria to wait for their parents, while other students went to tutoring and others went to after-school care. Overall, it was a full-day and a great experience. I think every parent should go and observe one day in their child’s classroom, so you as a parent know what is going on. I am glad that I went and did this. It gave me a greater appreciation for the superior education that my son is receiving. It also gave me some insights as a parent how to help him in various subjects. It gave me a greater appreciation for all of the teachers who diligently prepare to teach their students each and every school day. I probably did not do a thorough job in recording all of my observations, but wanted to write about this not only for a personal record, but to maybe help parents who may be undecided regarding the possibility of having their child attend a classical school. Personally, I would prefer a Christian school for my children, but here in Texas, private school education is not possible with our income because it is so cost-prohibitive. I am glad that my son is here at Founders Classical Academy in Flower Mound and look forward to having my daughter start Kindergarten here in the Fall. For a new school, they have a very involved Parent-Teacher Organization and there is a Facebook group for the parents of students which has been very helpful in getting missed homework assignments and other information regarding various events, activities, fundraisers, etc. What did we do before Facebook. We have been the beneficiaries of help when it comes to missing homework pages or assignments and we have always tried to help whenever possible knowing that there would be a day that we would need help ourselves. Also my son has made some great friends and we have gotten together with his friend and his family and had a great time. I also had the opportunity before I went for my day of observation to watch a video by Dr. Terrence Moore entitled A Walk Through the School. I highly recommend that you watch this video, it does a better job than my feeble writing attempt above. I purposely did not name any teachers or students for privacy reasons. The school did not ask me to write this review. Comments and questions are always welcome and encouraged.